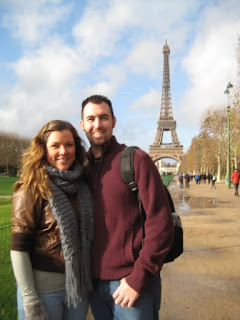 Warning: This is a very long post with lots of pictures, I had to do Paris justice! So grab a drink and get cozy. Absolutely dazzling. That is the best way to describe our long weekend trip to Paris. We experienced four days of wonderful in a beautiful city with some incredible landmarks, museums, food and, of course, wine. After arriving Thursday afternoon, we spent 20-30 minutes on our plane just taxing to the other side of the airport. It seemed to take so long that I was almost hoping they'd just drive us straight to our hotel. But we finally unboarded, scooped up our bags and had broken a good sweat by the time we located the rail station... Paris' airport is not small! Using the rail system can be incredibly daunting to first timers. My mom and I took a trip to London years ago and I remember my heart thumping and my brain spinning as we tried to trace each rail line on the colorfully confusing map and finally picking one we hoped was right. I think there was a few times we decided to just ride it and see where we ended up! When the trains stop and the doors open, it's a frenzy. You have a very limited amount of time for people to exit the train and new passengers to board. And if you're lugging suitcases, you'd better get a move on. My mom and I were boarding a train but didn't get on quite fast enough and the doors closed before I could get inside. They narrowly missed squishing me in half (these are not like your friendly elevator doors) and I could see my mom's panicked face as the train pulled away. Being separated from your traveling companion with no cell phones or general sense of direction can be a little scary! But she waited for me at the next stop and I caught up with her fine. 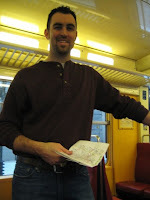 Needless to say, once Mike and I had lugged our bags down at least four flights of stairs and a couple escalators, we found the Blue line that took us to the Denfert-Rocheau stop. From there, we boarded the no. 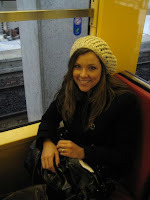 6 train and rode it straight into Paris. My navigational husband was smart enough to bring our GPS and load up on several maps before leaving the airport. We looked like the quintessential tourists--huffing and puffing as we dragged our bags past the stream of foot traffic and stood on a street corner, Mike intensely scanning the map while I immediately started snapping pictures. 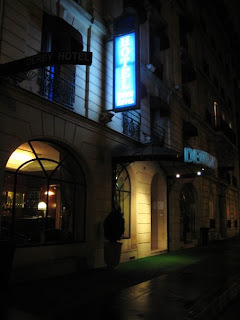 Our directional instincts proved correct, however, and we successfully made it to our cute little hotel, the Hotel Derby Eiffel, with a room in view of the Eiffel Tower itself. I was very happy with the service there, it's a small hotel but with friendly staff and clean rooms. There were only seven rooms on our floor and the elevator was barely large enough for me and my suitcase! It just makes it feel all the more cozy, I think. 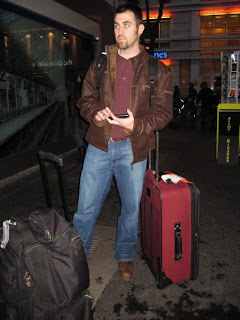 As is our custom when traveling, we didn't have any specific plans for the weekend. We usually do a little research on our destination to get a feel for the most popular activities but generally prefer to spot things on foot or talk to the locals for suggestions. 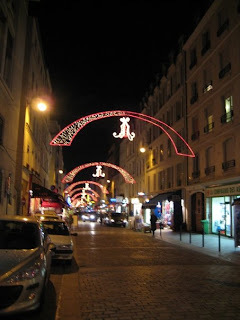 So for dinner Thursday night, we walked around for a few blocks before finding a cute little street, Rue Cardinet, with at least six very busy cafes and Christmas lights strung between the buildings. At this time of year, many of the cafes enclose their patio areas with plastic makeshift walls and heaters. 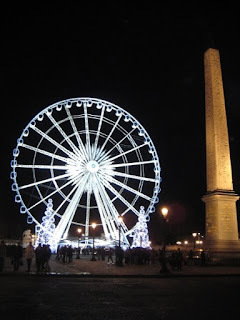 Those tables were so popular, packed with locals bundled up in their scarves and jackets, sipping wine and cigarettes dangling from their fingertips as they rambled on in French. Around 7 we got a cozy table at Tribeca, the chalk board menu propped out front had reeled us in. After stumbling through our order just a bit with the waiter, who spoke a little broken English, we waited on salmon and risotta and rumpsteak with fresh cut frites over two glasses of house red (it was full, fruity and smooth), peanuts, salami and fresh French bread. When I say fresh, I do mean fresh. Halfway through our meal, we noticed the restaurant slowly starting to fill up. 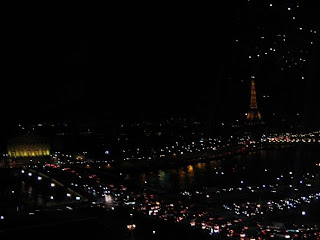 (Late night dining in Paris is quite popular, quelle surprise!) Right on time with the dinner rush arrives a delivery boy carrying a huge brown sack of four-foot-long French bread loaves, literally still warm from the bakers. It doesn't get much better than that! We truly lucked out with the weather, it was originally forecasted to rain all weekend. 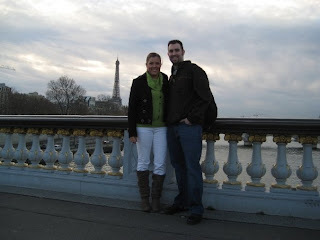 So after sleeping in on Friday morning, we made our way across the river to the celebrated Champs-Elysees. Both sides of the lower end of the street were absolutely brimming with small vendors for the annual Christmas market. 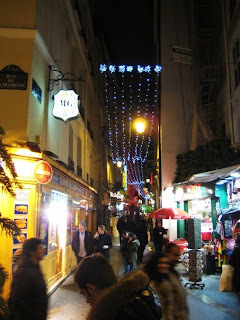 It was so much fun to navigate the crowded sidewalks, peering in on all the different wares. I bought a pair of soft, warm silver gloves because my hands were freezing and I'd forgotten my black ones. And I bought three bars of some of the best-smelling French soap I've ever found, I have no idea what "scent" it's supposed to be but since bringing it home and putting one bar in the shower, my whole bathroom and hallway now smells like it. We stopped for some amazing pictures of the large glass pyramid, which serves as the main entry to the museum. According to Wikipedia, it was commissioned by the President of France in 1984 due to the previous entrance's difficulty in accomodating large numbers of visitors. 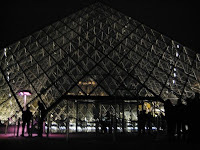 The new pyramid entry, made from 673 glass segments, allows visitors to enter, descend into the spacious lobby below, the reascend into each of the Louvre's exhibits. 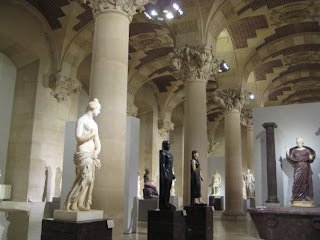 Unbeknownst to us, Paris museum workers had been on strike and many of the museums were closed the week we arrived. 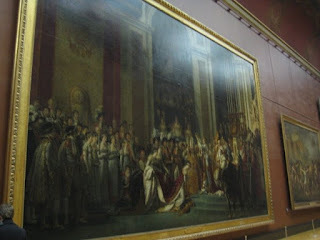 In fact, the Louvre was closed on Thursday but had reopned by Friday when we went! It is only €6 apiece to enter the main exhibits of the musem after 6pm on Wednesdays and Fridays, I couldn't believe how affordable it was to take in such valuable history. Better yet, they allowed photography of anything inside as long as you didn't use the flash. We went picture crazy! Despite our aching feet, we were completely awed and inspired for the next several hours. It was one of the most powerful displays of history, art and culture I've ever seen. 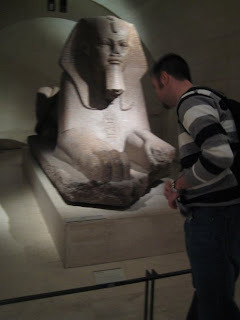 There were mural-sized paintings that looked as thought they'd taken years to complete, ornate ceilings and monuments, Egyptian mummies and original carvings from the walls of ancient tombs, artifacts from the apartment of Napeolon III (credited for helping round out the Louvre's collection), and more. 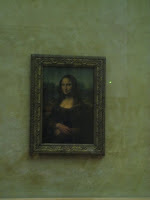 Then there were the highlights: the Mona Lisa, painted by Leonardo da Vinci in the early 1500s. 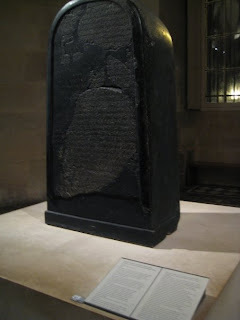 The paitining--now guarded at all times, hung behind a glass case and surrounded by a wooden railing--was actually stolen in 1911... "Louvre employee Vincenzo Peruggia stole it by entering the building during regular hours, hiding in a broom closet and walking out with it hidden under his coat after the museum had closed. Peruggia was an Italian patriot who believed da Vinci's painting should be returned to Italy for display in an Italian museum. Peruggia may have also been motivated by a friend who sold copies of the painting, which would skyrocket in value after the theft of the original. After having kept the painting in his apartment for two years, Peruggia grew impatient and was finally caught when he attempted to sell it to the directors of the Uffizi Gallery in Florence; it was exhibited all over Italy and returned to the Louvre in 1913. Peruggia was hailed for his patriotism in Italy and only served a few months in jail for the crime." 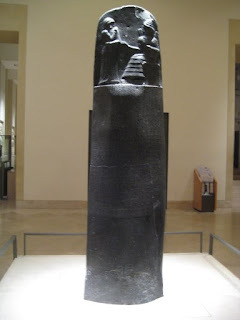 We also got to see the The Moabite Stone (first pic below) and the Code of Hammurabi (second pic). It was breathtaking to stand in front of something created in 1790 BC... something so detailed you could still see the individual cuneiform script even after all this time (third pic, look closely at the bottom). The level of artistic craftmanship, detail and, most of all, quality with which so much art was created in those times is simply mind boggling. It was late when we'd finished at the Museum, so we took a cab back to our hotel and stopped in at the nearby grocery store where I got crackers, cheese, salami, marinated artichokes and wine for dinner. Perfection! We listened to French TV while we ate in our hotel room and were even able to Skype our parents and show them the view of the Eiffel from our window. It's gorgeous at night as it rotates through different lighting effects. The first part of Saturday was spent beneath the Eiffel, our heads tilted back as far as they could go to take in the breathtaking lattice iron sculpture. It's over 1,000 feet tall and weighs more than 7,000 tons. The tower was constructed in 1889 by Gustave Eiffel to serve as the entrance of the city's Universal Exhibition or fair that year. Oddly enough, it was built to last about 20 years. We didn't go to the top of the Eiffel since the lines were shockingly long, instead opting to eat lunch at a small cafe on the River Seine just a few steps away. We made our way back to the Champs-Elysees, taking in the street's upper end shops and stopping for a few pictures of the beautiful Arc de Triomphe, constructed in the 1830s in honor of those who fought for France, particularly during the Napoleonic Wars. On the inside and the top of the arc there are all of the names of generals and wars fought. Underneath is the tomb of the unknown soldier from World War I. 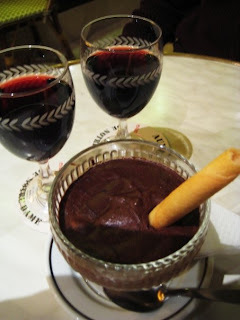 After the cathedral, we walked across the street to a lively cafe for two glasses of Bordeaux and some mousse chocolat. Delicious! 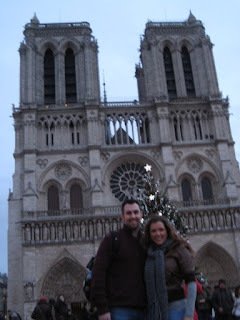 It was amazing to sit at a tiny corner table, listening to the bustling French around us with a view of the Notre Dame just outside the window. 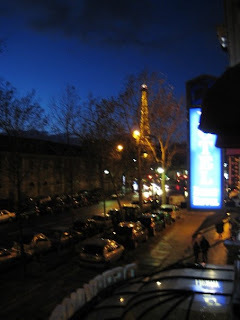 We truly enjoyed the many opportunities for people watching while in Paris, there's always something to take in. Our trip was topped off with a very nice dinner at Le Bosquet... another one of those fantastic places we stumbled upon by chance. We ordered the beef filet and a bottle of the red "wine of the month," a 2005 Bordeaux of some sort. 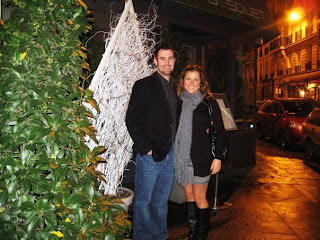 The food was so good (accompanied by more of that wonderful French bread) and we were thrilled to have enjoyed so many excellent meals while in Paris, a welcome change from the typically bland Scottish food. It was an absolutely magical weekend, we couldn't have asked for anything better! Paris is certainly a place we'd reccomend people to visit if they had the opportunity and it made us even more excited for our future adventures, discovering the history and cultures of the UK and Europe. Au revoir! Such wonderful reading!! I feel like I have been there through your words! Thanks for sharing your adventures with all of US!! very interesting work, joe. i appreciate you checking out our blog! we are discovering new tidbits of history everywhere we go these days!